I've mentioned before that I don't post reviews on a product unless it's something I like or something so flawed, I feel the need to warn you about it. I just don't want to waste our time on a mediocre product. It would be an understatement to say I like these products. If it's possible to fall in love with an inanimate object, then I am definitely smitten! Silky Cosmetics sent me these products last month to review, and I've been using them religiously for the past two weeks. I imagine most of you, like myself, have a fondness for bath and body products--probably not the obsession we have with nail polish, but I certainly enjoy these products and other cosmetic items as well. I have quite a collection of these types of products that take up an entire 3-drawer rolling cart, so it's safe to say that I have more than enough products to compare these to. What first attracted me to this company was the fact that their products (they also offer bath salts and body washes in addition to these two products I'm reviewing) are 100% vegan, and free of parabens, sodium laurel sulfate, petroleum, mineral oil and alcohols. They use quality natural ingredients and "we are huge animal lovers so we never, ever, ever test on animals". Their packaging is well-made and of good quality, and the products themselves, although natural, have a wonderful scent and great texture. You know how sometimes with natural products the scent is a little different and the texture can be as well? Not so with these, and I'll discuss that more below. Their motto is "You're never too old to be young and never too young to be sophisticated." Now I've used plenty of scrubs over the years, but this one beats them all. The reason I say this is that first off, the scent (Bliss) is heavenly. It smells somewhat of peaches and some other notes that I can't quite place, but it lasts all day long. There is absolutely no need to use any moisturizer if I use this in my morning shower. The granules do a good job of exfoliating and polishing my skin, and even though my skin feels a little oily once it's rinsed off, that disappears after I dry off with a towel, and I'm left with smooth, soft, silky skin that I cannot stop sniffing! The first time I used it, I scooped out about a tablespoon, which was more than enough, so I'm using a bit less now. The texture is fairly thick and heavy, so as you massage onto wet skin, it melts, and a little goes a long way. I am utterly amazed at how moisturizing this is and how well that feeling, along with the scent, lasts into the night. The key ingredients are Coconut oil, Shea butter, and Soybean oil. This is available in three other scents, Charm, Sweet Mint, and Sorbet. All of the ingredients are listed with each product on their web site. 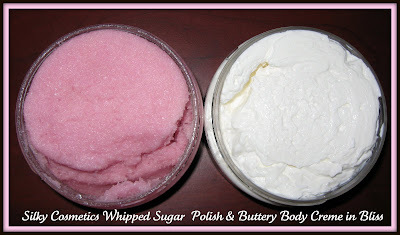 Initially, I used the sugar scrub in the shower, followed by the body creme as a moisturizer. I now use one or the other, because I don't need that much moisturization. The body creme has the same wonderful scent, and also lasts throughout the day and into the night. It's a lighter application of moisture, at least on my skin, but no less effective. My skin still feels soft and silky after an 18 hour day, and the scent is clearly evident. The texture of this is interesting--it reminds me of whipped creme--filled with air and very light. However, it's not filled with air, so you're still getting all of the product. It's not thick like a body butter, but much more solid than a lotion. It's smooth as can be, and dries quickly without any feeling of residue. This product comes in the same scents as the sugar polish, and has the same key ingredients. I personally think these products are top quality and I'll definitely be purchasing some when these start to get low. As much as I love the scent of Bliss, I'm very curious what the others smell like, so I'll probably try something different. You can sign up for their newsletter on their web site, and also follow them on Twitter here. They offer free shipping over $50.00 and also include a sample with every order. I don't know if they ship Internationally, but if you eMail them, I'm sure they'll be happy to tell you. *Products featured in this post were furnished by the manufacturer or PR firm for review. These sound wonderful! I love nice smelling body washes for my shower. I have some bath scrubs but I don't use them very often. I guess I just forget that they're staring me in the face! I have loads of the stuff. Mskes it bad when I want to try something new. I've tried not to buy any more body lotions or bath gels. I have a full shelf in the linen closet. That's the bath gels and powders. Then in my armoire I have loads of body lotions, body butters and perfumed body lotions that match all the fragrances I have. Did I mention I'm crazy about fragrances? I spray on perfume day and night. I'm never without it. Nothing makes me happier to spray on something and breathe deep. I just bought Green Tea fragrance by Elizabeth Arden. You also get a nice gift with purchase. Now's the time to look for the gifts with purchase. Mother's Day will be coming up so the stores usually have the GWP. Love it all.